Straight away I’m out of my comfort zone. Men will always be something of a mystery. What I do know is that the male midlife crisis isn’t quite the same as ours. Our midlife misery is fuelled by menopause but what’s behind theirs? I don’t know a man my age who isn’t showing some sign of fatigue or anxiety. Is there an equivalent male menopause or is it something else altogether? When we are young, we all dream of doing something wonderful and exciting with our lives… Anything is possible. It’s the opposite of adolescence. It coincides with our progeny embarking on their own life adventures just as our ageing parents face the end of theirs. We are, quite literally, caught in the middle. 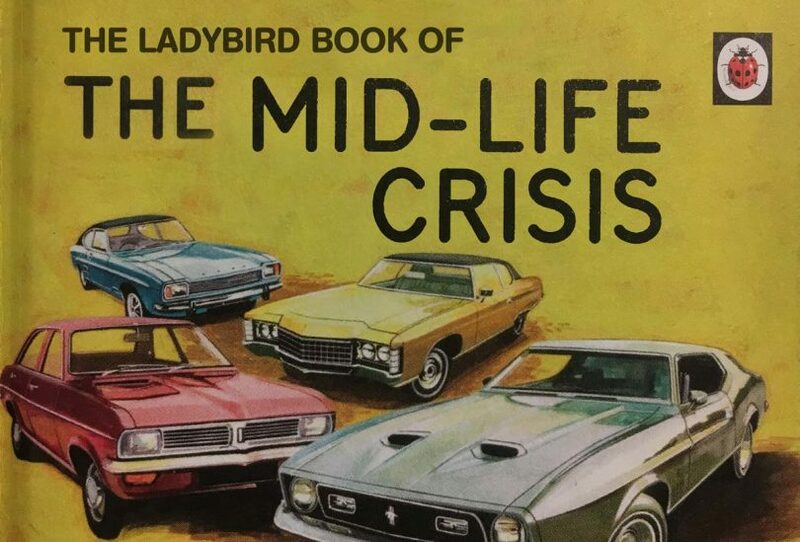 But is it fair to call it a midlife crisis? We don’t talk about a teen crisis – its just adolescence and a phase everyone goes through. What is really going on? It’s often suggested that men have a similar hormonal ‘change’ to women. Science indicates, however, that testosterone levels decline much more gradually in men, less than 2% a year after the age of 30 (source). Hang on – you say – what about that increased anxiety, irritability, falling asleep at 9pm, lack of libido and erectile dysfunction? It’s true that lower testosterone levels can cause many of the symptoms we associate with the male midlife crisis. But testosterone deficiency can also be the result of lifestyle choices such as poor diet, lack of exercise, obesity, alcohol and stress. One feeds the other. A healthy eating and exercise programme could be a good place to kickstart testosterone before heading for HRT. The difference between men and women is that our midlife meltdown stems from hormonal imbalance whereas men’s seem to be triggered by emotional and identity issues. Of course it doesn’t help that we experience it at the same time. Nature has played a cruel trick on us. Just as we lose patience with the world our men become grumpy shadows of themselves. It’s a miracle any relationship survives. 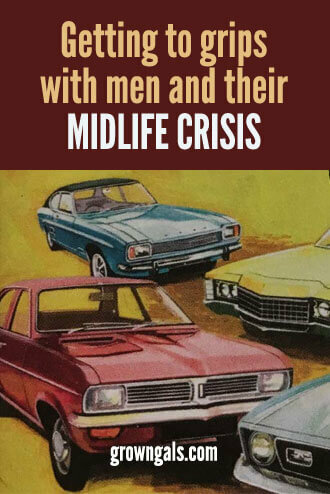 Traditionally the male midlife crisis is a bit of a joke. This is the bloke who swaps his people carrier for a motorbike. The man who decides, out of the blue, to run the London marathon. It is ridiculed as a desperate attempt to halt the ageing process. As far as I can see, as long as they have enough money to indulge their hobbies it’s life affirming to throw themselves into something new. If it’s physical, all the better, because all those stress reducing endorphins will combat depression and lower blood pressure. My other half does body combat at the gym; the class is mostly female and half his age. I’m not worried. Christ they’ve seen him at his sweatiest. But when he goes a week without that adrenalin rush, when he’s suffering from man-flu or pulled a muscle – his mood sinks like a stone. His self-esteem depends on proving himself fit and his mood depends on the exercise. The men taking to lycra and cycling on a Sunday morning, the triathletes, the rock climbers and the adrenalin junkies – they are literally running their way through midlife. That’s not to say that they don’t have sleepless nights worrying about keeping their job. It’s just that they have found an external, healthy focus to channel their energy away from self-doubt. Midlife is the perfect time for reflection (however unsettling) for both sexes. Changing job, moving house, leaving a bad marriage – these are opportunities to make the second half of our lives different to the first. Marital therapist Andrew G Marshall has made this point in his book ‘its not a midlife crisis it’s an opportunity’. He gives advice on how to spot and deal with a midlife crisis. I know, from personal experience, how hard it is to negotiate these middle years. It’s incredibly easy to lose your own way and feel cast adrift. It’s even easier to lose sight of your partner. All I can say is talk and listen. When you throw everything up in the air it’s pretty liberating to sort through the resulting chaos. As life expectancy increases it is important that we make the most of the next chapter. We have different priorities now. We can finally stop trying to be the person we think we should be and become happy with who we are.